There’s meat. There’s cheese. There’s... lettuce. There’s pork belly and caramelized bananas. Served with popsicles to dip in beer. Inside a janitor’s closet. In Silver Lake. 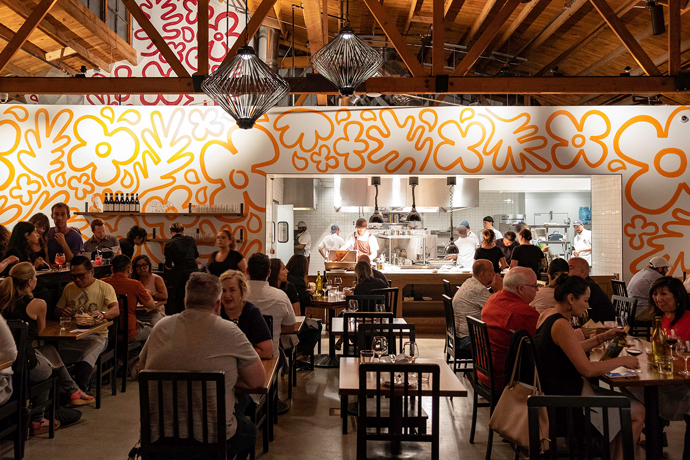 Say buenos días to Diablo, a curious new cafeteria of imaginative tacos and even more imaginative ways to mess with a beer, now open on Sunset Boulevard. This is a quick, easy, order-at-the-counter kind of spot, good for a Saturday fuel-up before the Thirsty Crow... and better for a Sunday noon-ish recovery meal. So first you’ll order some out-there tacos—they’re filled with everything from maple fried chicken to beef cheek to that pork belly and caramelized banana number we mentioned earlier. As for the beers, they’ve got a couple dozen mostly local brews—which you can upgrade to their version of a Michelada. Which means, basically, you get flavored popsicles to dip in your beer. First time for everything. Go with it. The room is big and low-ceilinged, lots of brick and chalk (the menu’s all over the walls), with a long table down the middle in case you’ve come with the entire Thirsty Crow clientele. Or you could book the secret “Janitor’s Closet”—it’s a tiny private room, seats about six, and there’s a PBR tap right there in the wall. Like all good janitor’s closets have.